Visual Thesaurus is an innovative product that improves your productivity and quality of work while improving your knowledge. Using this product is a unique experience and you will find that writing and learning new words will never be the same again. 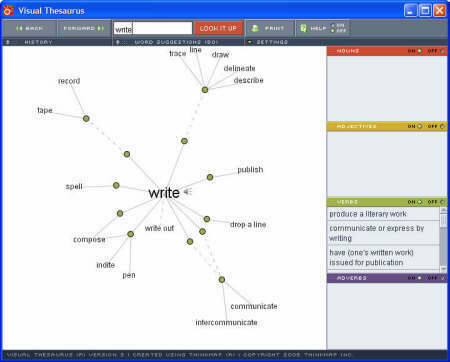 Visual Thesaurus uses the revolutionary Thinkmap software as a visualization engine. Thinkmap, which excels at displaying relationships, is ideal for displaying the relationships between words. Thinkmap gives users the ability to retrieve a result set from large data sets. The visualization mechanisms help users understand the composition and structure of the data that is being examined. Visual Thesaurus is a dictionary and thesaurus with an intuitive interface that encourages exploration and learning. Visual Thesaurus is a marvelous way to improve your vocabulary and your understanding of the English language. The Visual Thesaurus has over 145,000 English words and 115,000 meanings. The way in which the related words are presented is what makes Visual Thesaurus unique product. Visual Thesaurus’s intuitive interface helps you find the right words through their semantic relationship with other words and meanings. The pronunciation feature incorporated in Visual Thesaurus helps in learning the correct pronunciation. You can choose between British and American accents. This product helps in understanding the relationships between English words and meanings. In addition to synonyms, the Visual Thesaurus shows 16 kinds of semantic relationships. From any word, you can initiate an Internet search for either web pages or images. The Visual Thesaurus suggests alternatives so you can find the right word even when you’re not sure of the spelling. The Visual Thesaurus allows you fine control over your settings. You control font size, the types of relationships that are available, content filtering, and more. Visual Thesaurus is available in two editions—desktop and online. The desktop edition can be installed on your PC and needs and Internet connection only for audio pronunciations and expanding a word search to the Internet. The online edition does not require any software to be installed, but needs an Internet connection. Both the desktop and the online editions allow you to filter content at four different levels. This product is an excellent tool for improving your writing quality and productivity. This fantastic product is a must for all who are serious about their writing and want to improve their writing skills. You can try and buy the product from the Visual Thesaurus Home.